yes indeed, one more jumper. another excellent new look find, they really are pretty damn good for knitwear at the moment. worn with my leather shorts that i've had for a really long time, they're looking kinda worn and crumpled lately but they are so comfortable, and as you know, i love leather everything in terms of bottom-halves. i stole my boyfs scarf and turned it into a snood. i swear i couldn't survive winter without snoods. I love those colours together. Teal is pretty much the best colour ever. Super cute look. Love how you looped the scarf around your neck. It looks way more chic and it looks great against the color of your jumper. 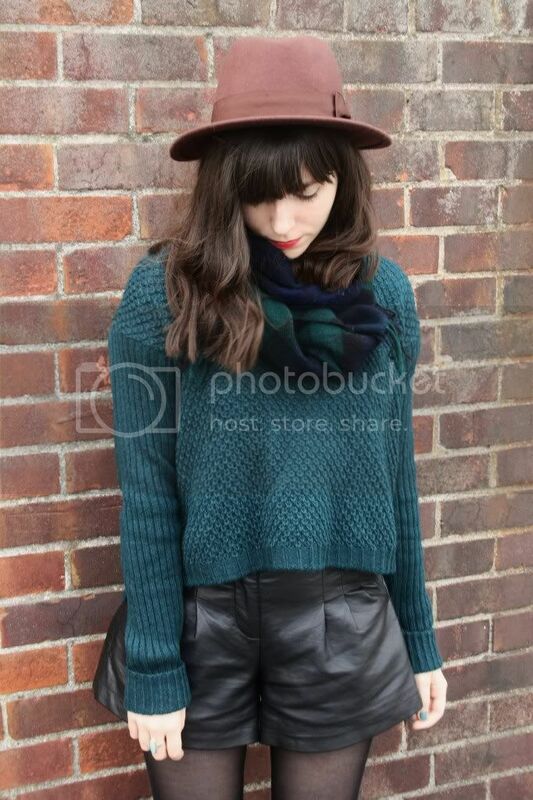 Those leather shorts are styled so nicely with the teal sweater and plaid scarf. I love it! Teal suits you so perfectly! <3 and I love love love the colour of your hat! I love teal is on trend!!! And those shorts... I need something similar, I've seen them in a lot of different blogs and they're great! I wish I had all of your jumpers! They are so lovely; I love the color of this one. This fat is so precious. I love how it compliments the teal. Those leather shorts look like they're the perfect cut. Loving the teal knit too. i like stealing my boyfriends clothes too shhhh! You look lovely, I love the colours of the scarf. Teal looks absolutely amazing on you! !